The Canton, Ohio running community has been desiring a quality race event for the past several years. 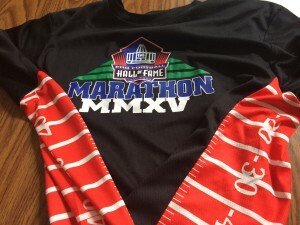 Last year, a new event organizer stepped up and staged the first Hall of Fame Marathon Weekend in conjunction with the Pro Football Hall of Fame. While I did not know any Casual Runners who participated in the event first-hand, I did hear from several non-runners who expressed excitement over this new event and told me that the organizers were turning a few heads in the community. When it came time for the second annual event, I knew I wanted to check things out for myself. However, I went into this event with what I thought were the appropriate expectations. As it was only the event’s second year, I was willing to cut them some slack in the organization, swag, and bling departments. I was surprised to learn that they did not need any slack at all, because these organizers certainly are on their game. Steve and I ran the inaugural Gold Jacket 5k the day before the race as our shakeout run. We figured that since we were going to the expo on Saturday, we might as well check out the other event while we were there. You can check out Steve’s full review of that event here. In terms of training, we have been training together since I got back from completing the Dopey Challenge, and I had been focusing on both maintaining my fitness level and trying to pick up my pace gradually (you know I hate speed work, so this was a nice compromise). As a result, I felt ready for this event without having specifically trained for it. The expo is held on the basketball court of the field house at Canton McKinley High School. This is a cool, classic venue that instantly evokes thoughts of the movie Hoosiers. If you don’t know, Canton LOVES their high school sports. Just Google the Massillon – Canton McKinley football rivalry, and you will know what I mean. So it was neat getting a chance to check out this venue. This is a cool event shirt, and yes, those are football fields on the side panels. 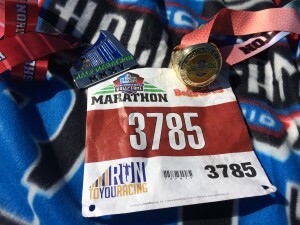 The Hall of Fame Marathon weekend is a smaller marathon event (they announced 600 marathon entrants, 250 5 member relay teams, and 2,000 half marathoners), but organizers did their best to stage an expo befitting of a big-time race. I take this as a good sign that organizers are committed to growing this event. The vendors were friendly and the expo was arranged along a linear route that made processing easy and congestion minimal. I felt it was a good balance of having a variety of vendors without taking too much time to see everything. Ok, I may gush a little bit here. Canton rocked it. Seriously, they just knocked it out of the park when it came to swag. The race shirts were awesome. They had paneled shirts for each of the 3 events that were similar yet distinguished by their accent colors (awesome branding choice). I love my runDisney race shirts, but this football themed shirt quickly shot to the top of my favorite event shirts. I know I am getting ahead of myself, but finishers also received a nice, large fleece blanket with the event logo at the finish, which would serve as both a great race memento AND extra post-race warmth given the event taking place in Northeast Ohio during the last weekend in April (more on that in a moment). Everyone knows that the quickest way to a Casual Runner’s heart is through great swag. This was very well done indeed. This was going to be a challenge to plan my race outfit. The weather in Northeast Ohio in late April is, well, in a word, frustrating. The weekend before we enjoyed temps in the high 60s. The following weekend, the forecast called for similarly nice weather. But on race weekend, we were treated to overnight lows in the low 30s, but there would be sunshine. During the Gold Jacket 5k I opted to wear long pants, a long sleeved base layer, a hoodie sweatshirt (tech material), gloves, and a headband, and I was WAY too hot. Not just warm, but hot. So I knew I would have to overcorrect the other way. 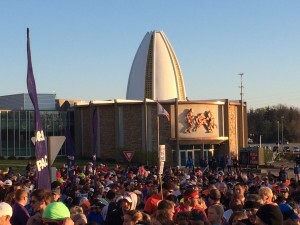 This was the view of the Pro Football Hall of Fame from the starting line. For race day I selected my Sweatvac Team Casual Runner short sleeved tech shirt (have to support the Team! ), my Sweatvac VBurst Hat, a pair of Hind Compression shorts, and a pair of Hind tech running shorts. There must be something about me sleeping at home the night before a race and messing with my race outfit. Remember when I ran the Pittsburgh Half Marathon and ripped my shorts getting into the car? This was not as bad, but when I went to put on my shorts I noticed that, while washing them, I managed to pull the drawstring through and so I could not tie them. I did not have time to fix the drawstring, but fortunately I had a backup pair sitting on the laundry pile (I won’t tell you if it was the clean or dirty bushel). I grabbed my Saucony Virrata running shoes, my Yurbud Triathlon Series Headphones, and my iPhone 5S. I knew the start would be cold, so I purchased a hoodie sweatshirt from a charity at the expo (more on that in a future feature). Yes, it was cotton, but I had every intent of tossing it during the race, where it would be collected and donated back to charity. Organizers required runners to park at the Belden Village Mall, from where they would be shuttled, where we met up with Candace and Kelly who were joining us for the race. The lines for the shuttles were long and orderly (and very cold!). Because of this, organizers pushed the start back by about 10 minutes, but did a good job of keeping everyone informed via the public address system, and no one seemed to mind. The walk from the shuttles to bag check (inside Fawcett Stadium) was reasonable and the volunteers were very good about providing direction. Bathrooms were ample for the crowds (did I saw that at a race event? Wow!). And we made our way to the start area, which was on the hill overlooking the Hall of Fame. While the view was beautiful (especially for this football fan), standing around on a big hill and starting on an uphill climb was not ideal. Steve and I decided we were going to gun for PRs that day and chose a pacer that would help get us there. Candace was also going for a PR and she decided to start with and hang with us as long as she could. The sun was shining (which was nice as it made it seem warmer than it was) and after the playing of the national anthem, we were off. The course starts – literally – on an uphill that you need to crest before heading into a residential area for the same downhill start that we followed on the 5k. Instead of turning left towards the McKinley Memorial, we turned right and headed off towards downtown Canton. The downhill portions were great for building up speed and Steve, Candace, and I were managing to stay ahead of the pace group for the first 2 miles and felt good doing so. Unfortunately, the course started to get more and more challenging with its rolling hills (I said challenging, not bad), and I realized that I had not done enough hill work heading into this event, and found it difficult to keep up. I told Steve to go ahead and maintain a comfortable pace, and that I would do my best to keep up, but I just could not. A look at the awesome stadium finish with runners cheering on their fellow finishers. As we made our way into downtown, I noticed that the white apple blossom trees were in full bloom, and they were spectacular. These trees are an underrated aspect to Canton. I noticed that I set PRs in the 5k and 10k, and was ecstatic, but soon after lost contact with my pace group. By this point Steve, Candace and I had all separated. Somehow I managed to stay ahead of the following pace group as we made our way out of downtown passed the historic “millionaires’ row” homes. Organizers staged hydration stations every 2 miles along the course. Two notes about these. First, I liked that they put them on the half mile (it is a psychological thing for me, as this gives me more mental checks during a race as opposed to them being located on the mile markers). Second, the volunteers deserve a big shout out as I never once saw a backup at the stations. They rocked it and quickly got us back out on the course. Additionally, portable bathrooms were well-spaced out throughout the course, which is another nice aspect especially because the course was almost exclusive in residential, industrial, business, and downtown areas where “going” by the side of the road would most definitely be frowned upon. We soon made our way past Malone University, through more nice residential neighborhoods, and then back into the parks surrounding the McKinley Memorial. Did I mention that there were hills in this course? My legs were starting to burn a bit on the long, slow climbs, but I kept pushing on. We made a turn to enter Stadium Park and the crowds started to pick up, which was a welcome site. Honestly, the only negative thing I can say about this event was that I was disappointed that there was not more crowd support, but hopefully that will improve with time as this event grows in popularity. Race Icon. After the park we made our way up a hill and onto the grounds of the McKinley Memorial. This is a beautiful, classic structure set atop the hill. On a personal note, President McKinley grew up in my home town and taught school in the building where I attended Middle School, so this was a nice personal connection for me. We exited the Memorial and began a mile + long climb back towards the finish. I saw many runners walking at this point, the climb was just too much for them, but I pushed myself to keep running. I knew at this point a PR was going to be out of the question, but I was not going to give up. We passed the 12 mile marker as we approached the High School (at the top of the big climb) and the marathon and relay runners went off to the left as we continued straight to finish the half. We saw this relay team proudly posing for a team photo at the finish. It was great seeing so many younger Casual Runners developing healthy fitness habits. We were rewarded with a nice downhill section (the reverse of the hill we climbed to start the race), where I had a dangerous encounter. I had been pacing in the vicinity of another runner for several miles. I noticed her because, well, she was dangerous. I noticed her drafting very closely to, and passing, other runners without leaving sufficient room. Frankly, this was both rude and unsafe. As I crested the hill I passed her, several feet to her right. Suddenly, on the downhill, she came up on my right, so close she grazed my shoulder and stepped right in front of me. I shouted a warning to her, but she did not acknowledge or even react to it. I was fortunate that we did not get our feet tangled (yes, she crossed that close to me). A few minutes later I saw her draft and then pass another runner, nearly knocking her to the ground. Please let this be a warning to run your race, but do so safely and not in a way that interferes with or endangers other runners. Race Icon. Returning to the course, we did a loop around the Pro Football Hall of Fame, and by this point I was spent. I was just hanging out with all I had. We rejoined the end of the marathon course just outside of Fawcett Stadium, then crossed onto the field turf surface (which felt amazing under my fee!). Even though I was spent, the adrenaline of entering the stadium and nearing the finish took over and I picked up a leg kick that I did not know I had. I rounded the last two corners and sprinted towards the finish around mid-field! It was exhilarating. The half marathon & 5k finishers’ medals with the event blanket given as a gift to all finishers. I received my medal and checked the clock – I missed my PR by 90 seconds. Was I disappointed? Absolutely. But I was also proud. I set my PR on a flat fast course at Presque Isle, and this course was much more challenging. I did well by my standards, and now I have a goal to work towards next time! Again, the organizers did not disappoint. The SMO for the half marathon was a depiction of the newer wing of the Pro Football Hall of Fame building, and is quite nice. The team relay medals included depictions of 1 of 5 offensive lineman, which, when united, formed the entire offensive line. This is a very cool design concept. 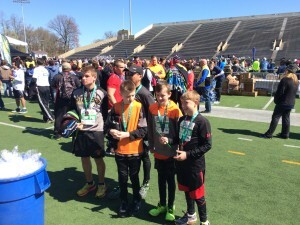 The full marathon medal was of Fawcett Stadium, site of the finish line and the annual Pro Football Hall of Fame induction ceremonies. Still, the 5k finishers’ medal stole the show, I mean, who does not love a massively large Hall of a Fame ring??? 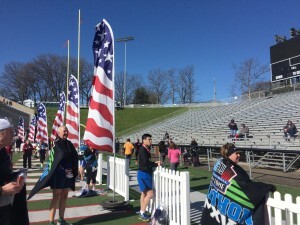 As the race finished in Fawcett Stadium, organizers allowed runners to lounge about the field turf to recover and socialize after their run. Given the mixed weather of the day (sunny but cold), the finishers’ blankets were a welcome treat for me (I just couldn’t get my body temp to settle). I enjoyed the setting, though would have loved to have seen some more people in the stands to cheer and the event really could have used some music. They did have plenty of food options (bags of chips, bananas, bottled water, Subway sandwiches) so their bases were covered there. As for my fellow runners, Steve ran an awesome race and was in the post-race area waiting for me – I saw him standing on the rails cheering me on during the final sprint to the finish. Candace ran a great race, and was the only one of us to set a PR on this hilly course (yes, we were jealous). Kelly was all smiles as she crossed the finish line, confirming that everyone in our little group enjoyed their half marathon experienced. To Candace’s dismay, there was no PR gong (she totally crushed her PR and deserved to ring something!). I knew there had to be a victory bell somewhere – this was Canton McKinley High School after all – so we went in search of and found their victory bell, which we borrowed for a PR picture. Return shuttles to the car parking was quick and easy and, after spending about an hour enjoying the post-race “lounge,” we were on our way back to our cars and in search of some much-needed lunch. When we were pulling into the parking lot to catch the shuttles to the race, Steve and I decided to rock out to Let It Go from Frozen, because, well, it was freezing cold that morning and we had to keep our sense of humor. In addition to my traditional race songs on my playlist, I added Best Day of My Life by the American Authors and Everything is Awesome from The Lego Movie because, well, how can you not get excited for running (or anything) while listening to that song? I had intended to add the NFL Films theme song as well because of the Hall of Fame theme, but it completely slipped my mind until I arrived at the starting line. Oh well. I enjoyed my first Hall of Fame race weekend experience. The organization was evident and everything ran smoothly. The swag, well, I’m beating a dead horse, but it was awesome. More than anything though, I am excited about the potential for this event in the future. I hope the community starts to get behind this event more and more, because I really believe that they are onto something good here. We have more coverage of the Hall of Fame Marathon weekend with our review of the inaugural Pro Football Hall of Fame Gold Jacket 5k and you can check out our YouTube video of all of the excitement of the weekend’s events. Neither Mike nor Casual Runner received any compensation for this review. The entry for the race reviewed herein were provided by the event organizer for purposes of this review and the opinions are solely those of the author.